All elements that you see in the demo are what’s possible to work with and more, but you’re not bound by our demos! Mix and match elements from the different demos to create the pages you need and let your creativity run wild! Loads of Custom Page Builder Elements & Counting! – The page builder in Marseille comes packed full of features that are totally customisable, to extend that we’ve hand designed and coded another load of elements for the page builder, just for Marseille! Full blog feeds, portfolio feeds, carousels, you name it! Best of all, each element is totally customisable, show only certain categories in a page, define background images, everything! 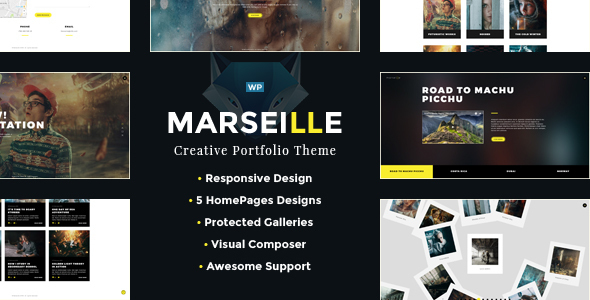 Custom Logos – Marseille lets you set a custom logo, retina logo, and even a logo for the WP Login screen, all with a few clicks in our beautiful live preview theme options. Even our theme options let you see your theme changes in real time! Unlimited Colour Schemes – Marseille gives you full control over the theme colours, using our live preview theme options you can change all the colours in the theme. WPML Support – Full multilingual support is baked right into Marseille! Full .po file available for more simple translations also.